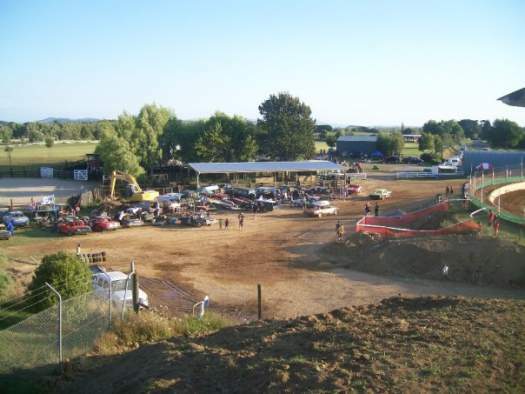 Location - The speedway is located in the small township of Kihikihi just south of Te Awamutu. From the main road look for the smallest sign you've ever seen. It will be on your left if travelling south. Go down this road until you get to the roadsign pointing towards the Kihikihi Domain, turn right. The track is near the end of the road and on your left. Parking - Parking is normally located in the sports field next to the track. Try to avoid this as there is ample parking on the road which can lead to a quick getaway. Premiere Meeting - Speed and Smash fest is the big end of season showdown. The meeting often features a 4-way Stockcar Teams showdown and a big Saloon event. However this event has been superseeded by the Andrew Edwards Memorial. 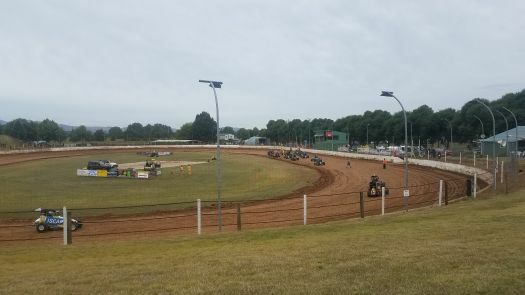 An event headlined by winged Sprintcars but also including plenty of premier classes and drivers. 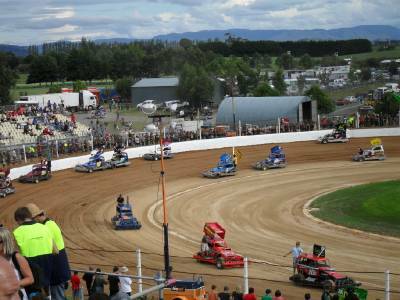 Also worth attending - When they get the track right Midgets are very good to watch. Try and get along for the Rosetown Midget 30 lapper. 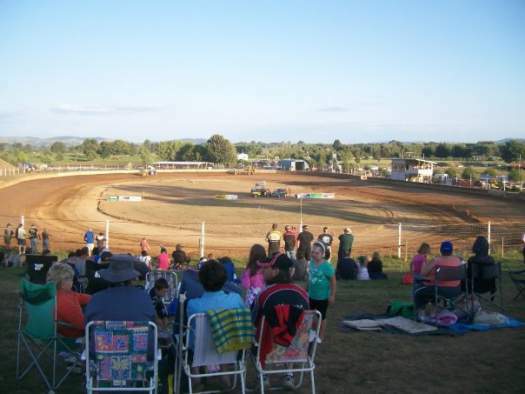 The King Country champs for a variety of classes can be worthwhile if a good fields presents. Best spot to sit - Give the back straight a miss. The track banking does not make for good viewing. In fact depending on where you sit your view may be restricted to watching wings and fins go by. High up in turn 3 is the pick of the spots for a beautiful view of the entire track. 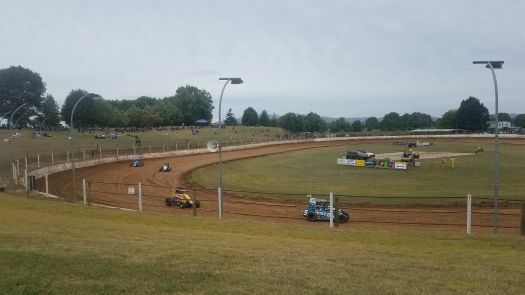 Classes run - Youth Ministocks, Stockcars, Superstocks, Streetstocks, Minisprints, Midgets, Six Shooters, Production Saloons, Saloons, Super Saloons. Uniqueness - Kihikihi has transfered from a sleepy Sunday afternoon dust bowl to a player in the Saturday night speedway market. With the move has come increased crowds and far superior shows. 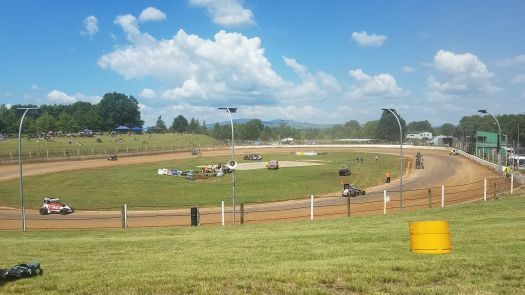 The track itself has a fair amount of banking and is plenty wide to allow for quality racing. However it's not excessively wide and contact classes can and regularly do put on a show. 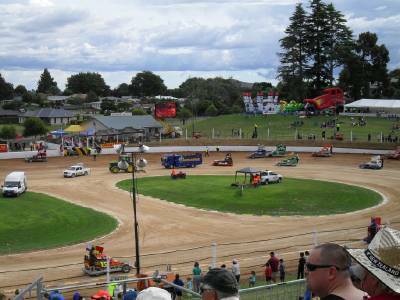 Kihikihi is perhaps the best track in New Zealand in terms of catering to the wide variety of classes we race.